In the Spring of 1995, man-child Tommy Callahan III got off a plane in Sandusky, Ohio, to take over the loading dock of his father’s company and was greeted by uptight executive Richard Hayden. One of the greatest comedy duos in film history was born. 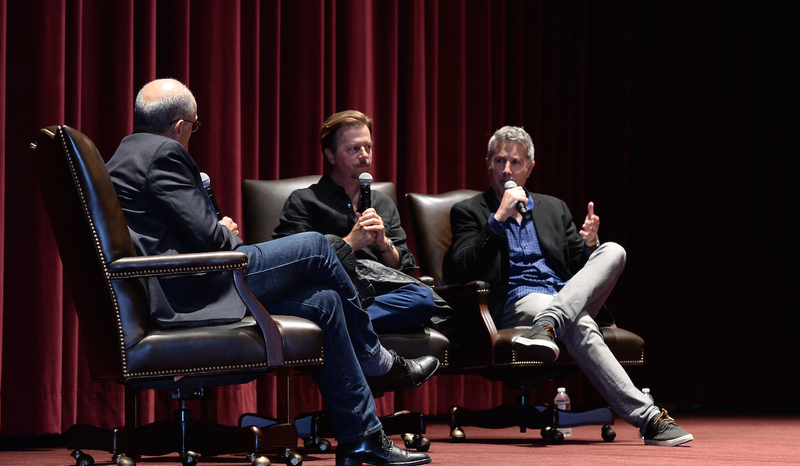 Twenty years later, at a sold out screening of Tommy Boy in the Frank Sinatra Hall at USC, alum/director Pete Segal, star David Spade, and writer Fred Wolf shared with students the stories of how the unlikely classic made its way to the screen through nervous breakdowns, unfinished scripts, and a deer that simply wouldn’t be trained. The screening was presented as a co-production of Movies We Love and Comedy@SCA. Comedy@SCA co-founder and SCA Professor Barnet Kellman moderated the Q & A. "When I wrote my book [Almost Interesting], people said, 'You have to write about Tommy Boy. You have to write about Chris.’ I did a whole chapter on Tommy Boy because it's the one that I hear about the most,” said Spade. “We hit [a movie] that worked. I know it sounds cocky. I was spoiled because of Pete [Segal] and Chris [Farley]. We did it. The casting was right. The director was right. It was a gift. You have highs and lows in a career but we got this one right." Tommy Boy was filmed while Spade and Farley were both still starring on Saturday Night Live and their schedule was lovingly called, “the back and forth.” They would film in Canada for two to three days and fly back to New York for Wednesday through Saturday for table reads for SNL. Spade said that he was exhausted but Segal’s loose directing style helped he and Farley, who passed away in 1997, navigate the film and gave the piece its improvised feel. Tommy Boy is turning twenty years old this year and its cult following continues to grow. Kellman attributes the success of the film to a combination of qualities that the film possesses and urged all of the comedy students in the audience to follow its example.